Above Photo: ELIAS NEWMAN. Awdah, a Palestinian Bedouin community activist, told me and my fellow Birthright walkoffs about fighting for the survival of his family and community in the West Bank. As he walks, I sip sage tea from a small glass cup and look at pictures of Awdah’s uncle. I hadn’t expected to be in Umm Al-Khair that night. But two days earlier I had walked off my Birthright-Israel trip along with seven other Birthright participants. Birthright, which since 1999 has sent more than 650,000 young Jews like me on free trips to Israel, claims to be an apolitical trip intended to put young Jews in touch with our history and culture. Over the course of a week, however, it became clear that Birthright was advancing a political agenda, both hiding and supporting Israel’s military occupation of Palestinians. How could we see and understand the truth of what was happening in Israel without hearing from Palestinians living under occupation? So after days of struggling to understand, I decided to walk off the trip. A participant on my trip reached out to IfNotNow, a movement of young American Jews working to end our community’s support for the occupation, looking for ways to confront Birthright in their miseducation They helped put us in touch with Israeli and Palestinian anti-occupation leaders like Awdah and his family, who offered to show us what was really happening in Israel. ELIAS NEWMAN. Endlessly rebuilding homes and community spaces, all under looming certainty of future demolitions, has left Umm Al-Khair in a state of constant instability. Umm Al-Khair in the South Hebron Hills, where Awdah and his family live, is under constant threat of destruction. 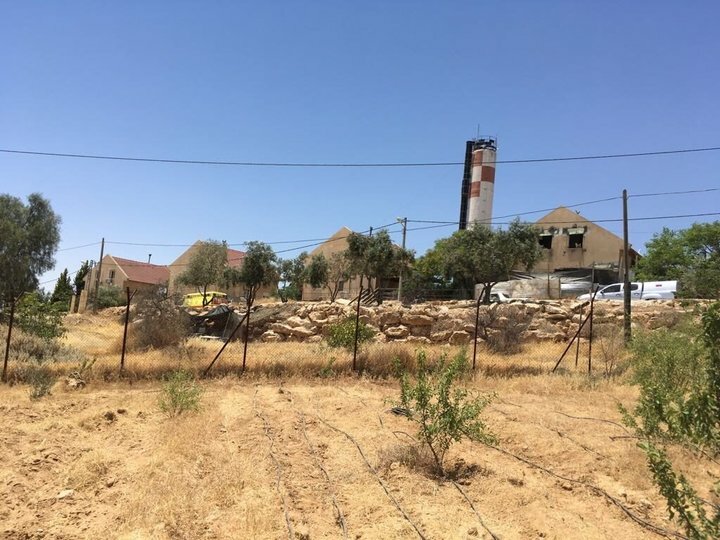 The Civil Administration, the Israeli government body that controls resources in the West Bank, has repeatedly ordered the demolition of structures in the village, claiming that they are built illegally. The Civil Administration controls almost every aspect of life for Palestinians living under occupation: demolishing buildings, cutting off electricity and limiting Umm Al-Khair’s water supply to only seven hours of running water a week. The Community Center, which doubles as a summer camp for children, has been demolished and rebuilt twice already — once in the middle of the night, while Awdah was sleeping inside. It’s still hard for me to fully grasp and describe the trauma Awdah and his family face. 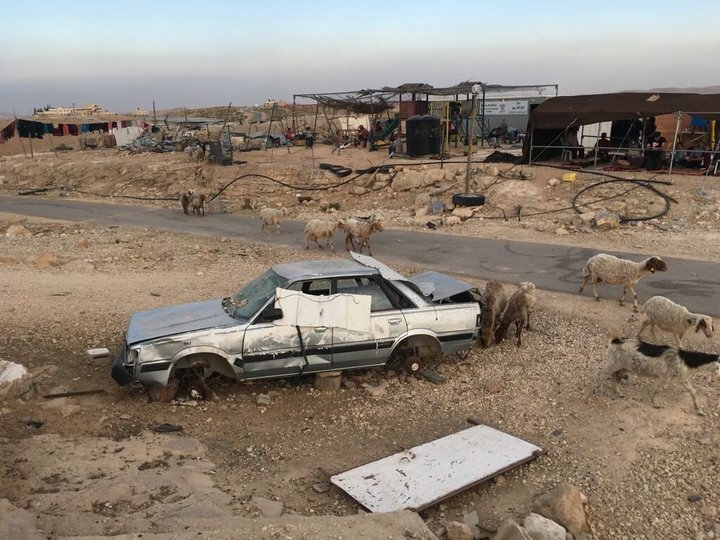 Umm Al-Khair, a village of tents and sheds, sits a stone’s throw from the encroaching Israeli settlement Carmel, a sprawl of large, suburban-style houses. The inequality is maddening. The settlements display an array of bright street lights in the middle of the night, hiding the stars in the sky, while Umm Al-Khair has been denied electricity by the Civil Administration and uses a handful of solar panels to provide energy for the entire village. Because the settlements have abundant access to water, they’re able to grow forests of trees; Umm Al-Khair uses their seven hours of water a week to give drinking water to their children. ELIAS NEWMAN. Large surburban styled houses and amply watered trees define the line between the Israeli settlements of Carmel and Umm Al-Khair. At the very same time that I was with Awdah and his family, my friends and peers still on the Birthright trip were also in a Bedouin village. But they weren’t hearing about the daily horrors of occupation or the difficulty of preserving the Bedouin way of life in the face of Israeli demolitions. Instead, Birthright offered them a night “dreaming under the stars” that would be “just like the fairy tales,” according to the website of the Bedouin-styled “lodging site” Birthright takes participants to. Birthright participants are promised camel rides, coffee ceremonies and “hospitality.” There’s no sign of the real hardships faced by Bedouin communities in Israel and the occupied territories. To me it was clear: While I was learning about the occupation’s role in destroying the lives of innocent Palestinian children and families, Birthright was teaching young Jews a rosy narrative intended to obscure the Israeli government’s military control over millions of Palestinians. I hadn’t come on Birthright expecting to walk off and meet Awdah. I had boarded the plane to go to Israel for the first time excited to learn more about a country my family loves. I wanted to connect with my Judaism, and to be honest, the free trip was a pretty big factor. But I’ve learned that Birthright is not just a free trip. I was lucky enough to be traveling with people who knew to ask questions about the separation wall we drove past, about the false maps Birthright handed out, and about the fact that Palestinian people live without basic civil, political and economic rights. Many of my fellow walk-offs had learned about these things from IfNotNow, and came prepared to challenge Birthright if they didn’t give a full picture of what was happening in Israel-Palestine. Birthright is funded largely by the Israeli government and right-wing American billionaires with ties to President Donald Trump, like Sheldon Adelson. When they saw that our itinerary included a visit to the Davidson Center, an archeological park that is operated by the radical settler organization Elad, they invited me and others to take part in the walk-off. Elad uses the money it gets from the entrance fees of tens of thousands of Birthrighters each year to fund settlements and displace Palestinians living in occupied East Jerusalem. It was clear in that moment that Birthright wasn’t just hiding the occupation from us; it was supporting it. Perhaps it shouldn’t have been surprising that Birthright was pushing a pro-occupation agenda. It is funded largely by the Israeli government and right-wing American billionaires with ties to President Donald Trump, like Sheldon Adelson. Birthright claims to be apolitical, but because they are financially and ideologically invested in the occupation, they hide Israel’s military-backed violence and countless human rights abuses from young Jews. Visiting Umm Al-Khair showed me just how much Birthright is leaving out. It’s a moral failure for the largest organization that educates American Jews about Israel to tell a false narrative that obscures the truth about the occupation and its effects on Palestinians. If I didn’t walk off Birthright, I would never have known the story of Umm Al-Khair. I would have gone back home without hearing about the settlements, the West Bank, or the lives of Palestinians. If Birthright were really the apolitical educational institution it claims to be, it would tell the whole story. I and other young Jews like me deserve to know the whole truth, and the people of Umm Al-Khair and Palestinians like Awdah, who are just fighting to live, deserve to have young American Jews on their side. 1)	You:	WHY I WALKED OFF MY BIRTHRIGHT ISRAEL TRIP	Me: You have no birthright or any other kind of right to Arab Palestine except via force. If Ashkenazi thugs were not walking around Palestine armed with machine guns, then you would realize that you have zero right to Palestine. You – like any other Americans or Europeans – would have to stand in line at a Palestinian embassy and obtain permission to land on that land. Palestine is nor your grandma’s or grandpa’s land, is it? We are so sick and tired of Europeans claiming Palestine as theirs. It is not! Palestine was invaded by a totally alien and totally European Jewry. 2)	You:	my fellow Birthright walkoffs	Me: Let me guess: you and your fellow “Birthright walkoffs” were lily white Ashkenazi, right? What are the chances that Ugandan Jews would be invited to do a “Birthright” walk on Palestine? 3)	You:	Birthright, which since 1999 has sent more than 650,000 young Jews like me on free trips to Israel,	Me: Let me guess: 100% of the 650,000 were lily white Ashkenazi “Jews”, right? 4)	You:	claims to be an apolitical trip intended to put young Jews in touch our history and culture. Me: You have no history or culture in the Middle East. You have stolen Hebrew – a Middle Eastern language – that no Ashkenazi spoke before, you now claim Arabic foods, music, dance and history to be yours. Are you an Arab? Tell me what you consider to be your “history and culture”? Is your “history and culture” Middle Eastern or European? 5)	You:	Birthright participants are promised camel rides, coffee ceremonies and “hospitality.” Me:Have you not wondered that the Ashkenazi was claiming all Arabic culture including the camel as his own. When was the last time an Ashkenazi ever came near a camel before he arrived as a predatory European invader? Palestine is Arab and the Ashkenazi is of European ancestry at 100%. 6)	You:	I wanted to connect with my Judaism, and to be honest, the free trip was a pretty big factor. Me: Do the millions of Chinese or Indonesian Muslims need to go to Saudi Arabia to connect with their Islam? As I said, if Ashkenazi thugs were not roaming around the fields of Palestine carrying machine guns that you would need to visit a Palestinian embassy to visit Palestine – and it would be up the Palestinians to give you or deny you permission to enter Palestine. Palestine is not your grandma’ land. You expected praise for your courage to “walk off” a free trip to Palestine,right.? You need to understand that you have zero right to Palestine and your right now is obtained via the use of Jewish force. Noted; no time to peruse in detail. The best takeaway for me from this is that it originated in the HuffPost — I hope in the print edition, online and anywhere else that it might reach out to and impress anyone who might be moved to consider the naked horrors of the Zionist enterprise in its myriad forms and criminally psychotic manifestations. May God, along with a few good, observant, justice-oriented humans, damn it and erase it from the pages of time.